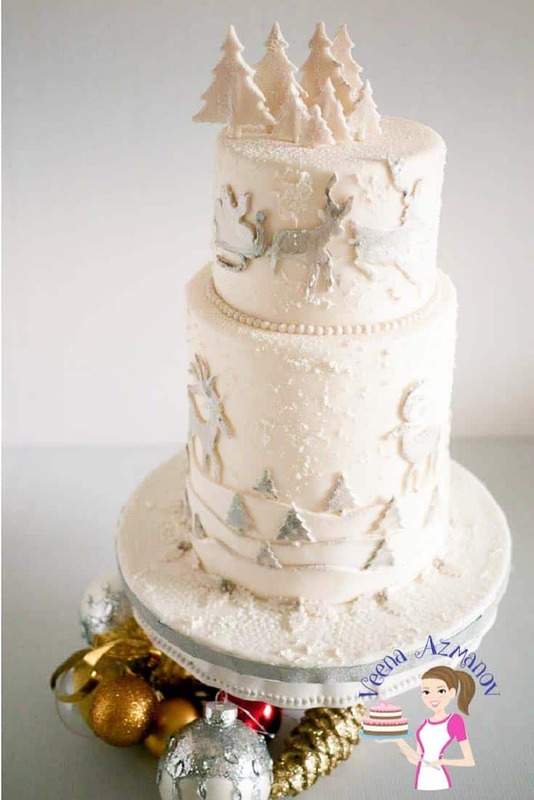 A Frosted Christmas Cake for a beautiful Christmas theme wedding with white Christmas trees, frosted snow effect. The sleigh and the snow-capped mountains. All made in fondant. Here’s a simple and easy tutorial that I hope you will find useful. If I got married again I’d make a wedding cake similar to this. I just love how beautiful this cake turned out. 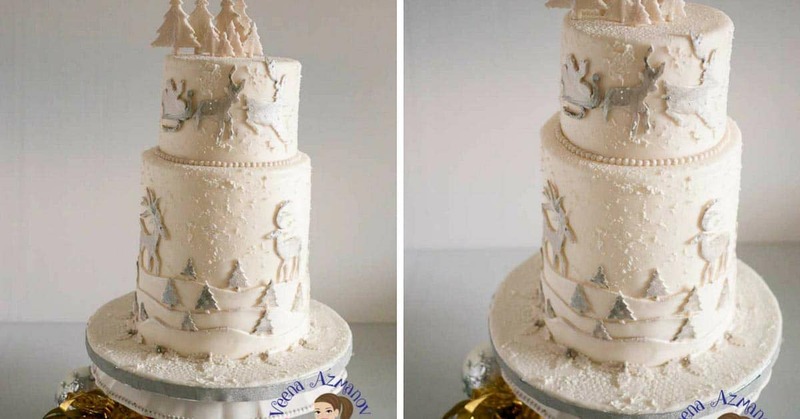 The concept of white wedding cake with the frosted effect is just so festive. The bride is a Catholic girl marrying a Jewish boy here. 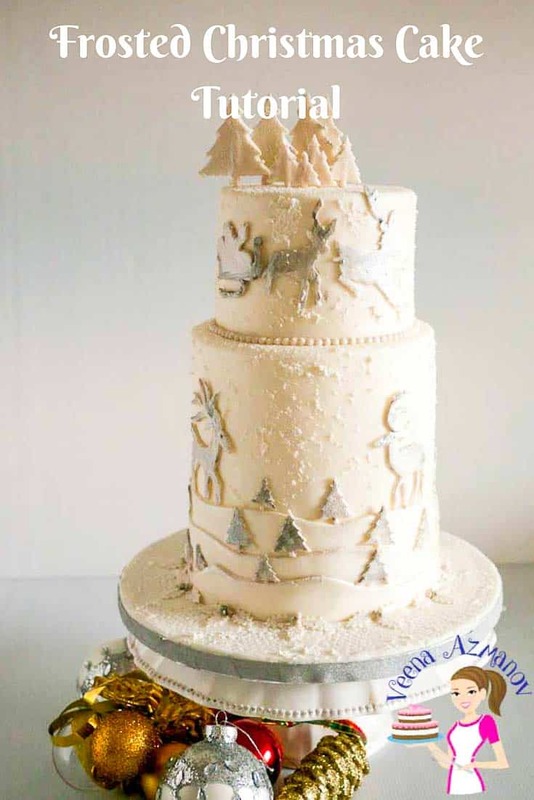 She was missing Christmas back home with her family so she decided she wanted to make a Christmas wedding cake and then during the consultation, I suggested the frosted them which just swept her off the floor. Honestly, this cake looks more gorgeous and beautiful when you see it in person. Today was one day when I really wished I had a DSLR camera. Photographing white on white can be a nightmare when you are a novice. This one looks so Plain on the pictures compared to how beautiful it looked in reality. When I was commission this cake, I knew I had to make a tutorial for this cake. It is actually a very easy cake as you can see. Of course, I am using a double barrel cake but you can use a single 8″ cake tier for the bottom too. 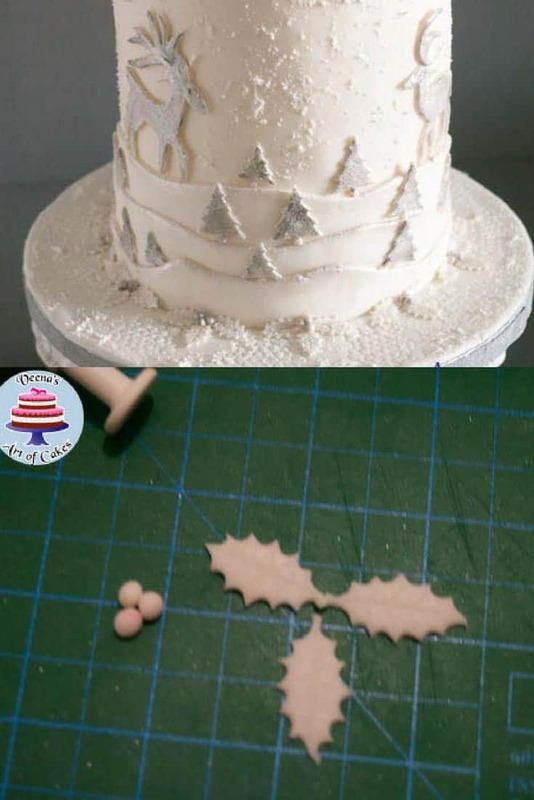 I thought I’d share with you how I made my Christmas trees on the top of this cake. 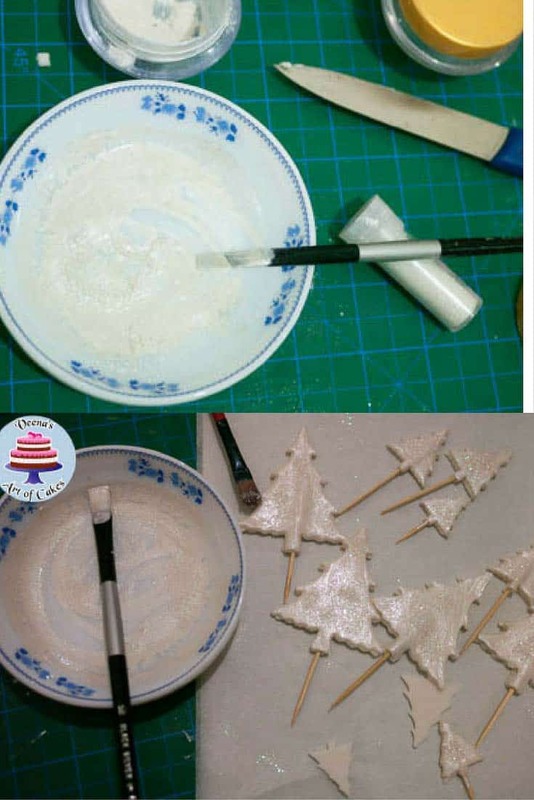 Here you can see below I used these Christmas tree cutters, If you don’t have a cutter u can pricing a template from online or you can even make simple long triangles. Trust me they will look good. Make enough so you can place some on the top and some on the cake as well. 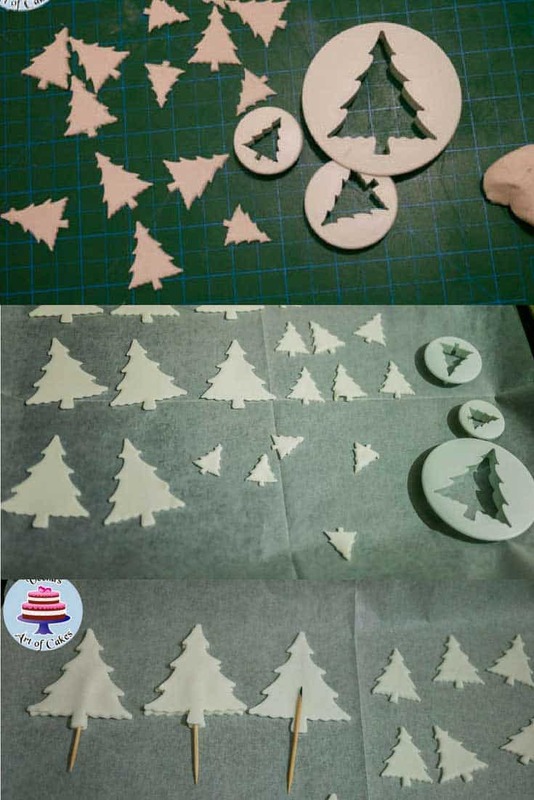 Two cutouts will make one Christmas Tree. All you do is dampen one with water. Then place the second one on top. These have to be dried flat overnight. Once dried – brush them with some Luster Dust diluted with either clear alcohol or lemon extract. While the Luster dust was still wet – I sprinkled on some Rainbow dust to give it that Sparkle look. Many of these are non-toxic but still non-edible and so they need to be removed from the cake before you serve the cake. The Reindeer and the Carriage. I just got some pictures from Google that I liked and cut them out on fondant. Then, I added a bit of CMC or Tylose to my fondant so it was a bit firmer to handle. Use a new exact-o knife for clean edges. 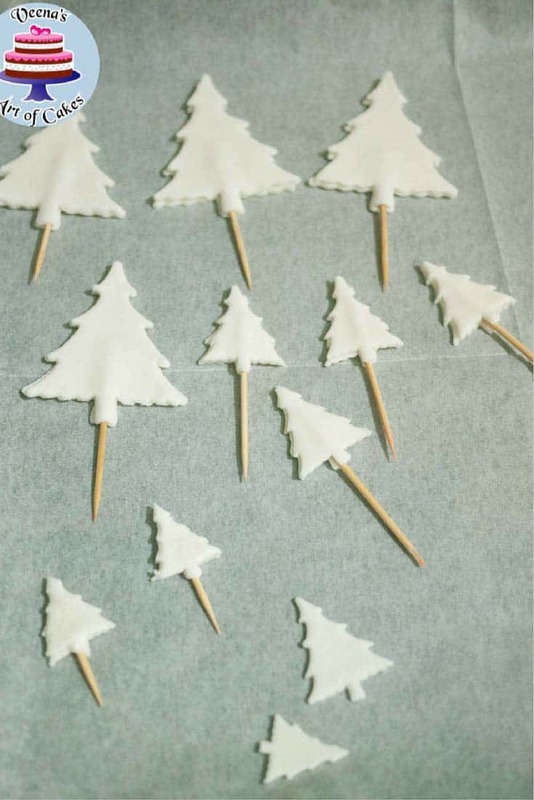 Then dust them the same way we did the Christmas Trees above. 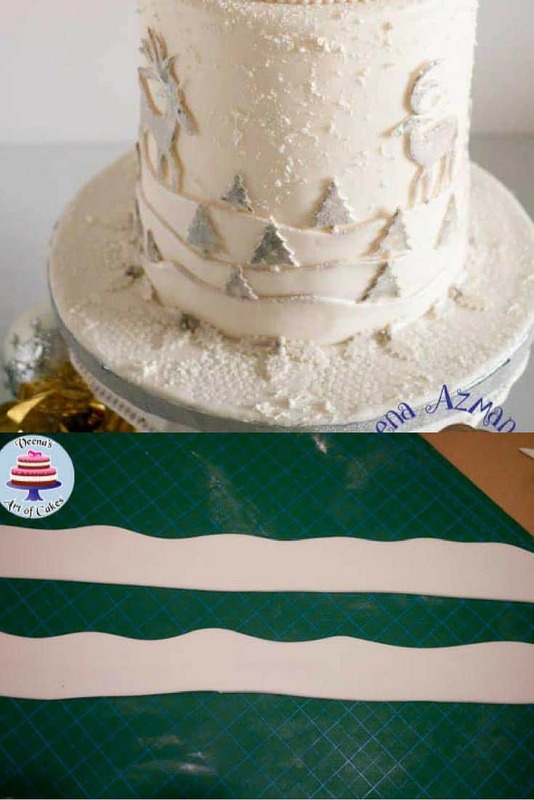 just rolling out strips of fondant and cutting them out like waves. No templates just a clean pizza wheel and go in a swirly motion. Place them on the cake with a dab of water. I gave them a light brush with the luster to kinda highlight them out. How to make the Frosted look on the cake. Well, here’s where I forgot to take a picture. The frosted look is basically just Royal Icing in a bowl. You want a thin consistency. Then take a clean new soft sponge. Dab it in the royal icing, then dab it on the cake. Just dab dab dab. Lastly, I just dusted the cake with some powder sugar. The more random you do this the better it will look. Lastly, the border on the bottom cake is just three holly leaves cut with a plunger cutter and three small tiny white balls. Once all the elements were on the cake. 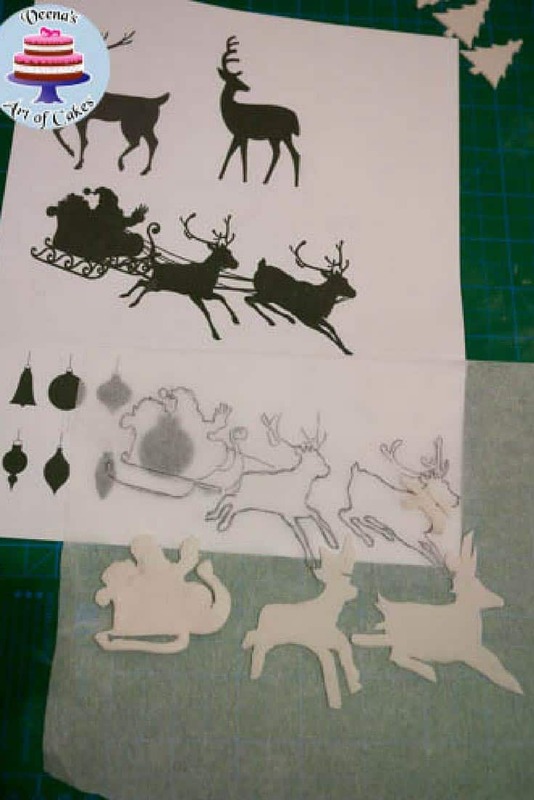 I brushed the trees, reindeer, and carriage with a bit of silver. Not too thick. In this case, I used only one thin coat but you can see that it helps bring out the elements on the cake. The white on white while it looks great in reality it does not show well in a photograph. 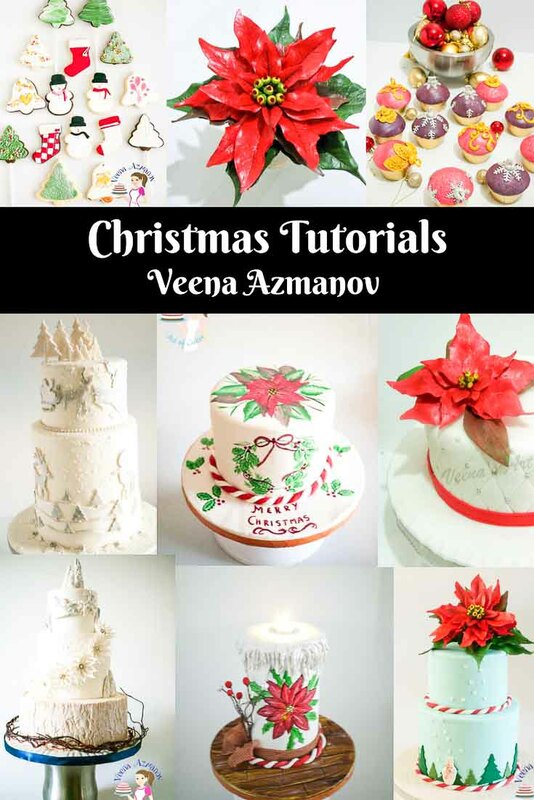 Click here to see all y Christmas Recipe and Tutorials. Gumpaste Poinsettia with Poinsettia Cutter or Gumpase Poinsettia with leaf cutters. I am planning on making your beautiful cake for a party. But several people have expressed a strong dislike of fondant. 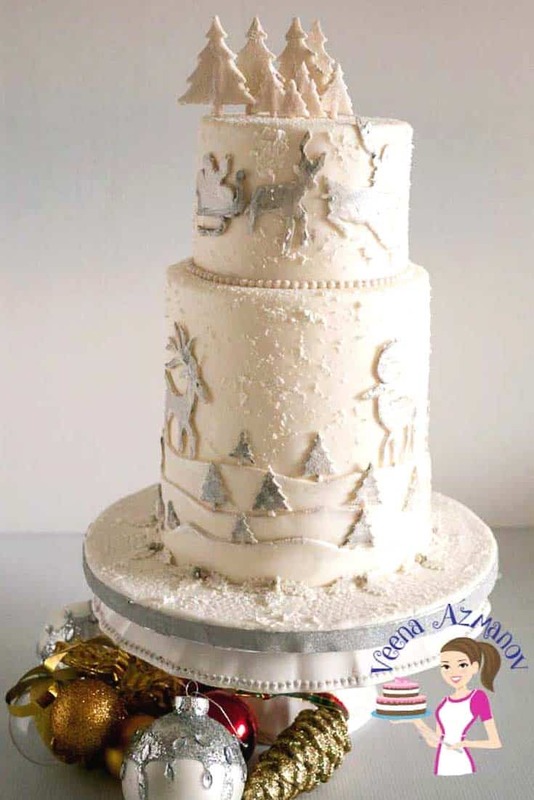 Do you think it would be ok if I cover the cake in white chocolate ganache, but do the decorative elements in fondant, or even white modeling chocolate? Could I still highlight in silver if I use white modeling chocolate? Thank you very much for this beautiful design, and hope you are able to reply. Thanks again. You are very welcome <3 Yes you can get a smooth finish with W. Ganache or white MC - Yes! You can dust MC with silver. Hi veena, your works are amazing! Am really blessed to have found your site am self taught because I cantt afford classes. Am a fast learner. Am so happy learning different techniques from you. You are a blessing to me . Thank you! Thank you so much for your kind words Susan. Appreciate it very much.